Can Washington’s Water Resources Program ‘just say no’ to new water rights that impair instream flows and harm fish, wildlife and water quality? It’s a question CELP has asked for 20 years, and unfortunately, recent Department of Ecology efforts indicate the answer is still no. As you may recall, in October 2013, the Washington Supreme Court issued its decision in Swinomish Indian Tribal Community v. Ecology: a decision that underscored that instream flow rules are bona fide water rights that Ecology could not subsequently abrogate in favor of permit exempt wells. That decision has prompted Ecology to explore with the counties alternative means of supplying water for new development. At first Ecology was talking only with the counties. At CELP’s insistence, Ecology opened up its conversations to include interested Tribes and CELP in a new a new stakeholder process, called Rural Water Supply Strategies, to craft responses to the Swinomish decision and others that constrain the use of exempt wells. For more on the Swinomish decision and its implications see Suzanne’s article, “No Quick Fixes to Competing Demands for Water” (WA-AWRA Newsletter, June 2014). The first meeting occurred on Monday, June 16th. CELP is concerned that the process might become be better described as “Undermining Washington’s Instream Flow Program” since the majority of participants asked that Ecology subordinate instream flows to new wells for rural development. Of particular concern: suggestions to create a blanket exemption to allow new exempt wells regardless of impacts on instream flows, and to use “out of kind” mitigation to fund habitat restoration disconnected from actual depletion of instream flows caused by new wells. Ecology is not authorized to utilize out of kind mitigation to substitute for instream flow depletion. When all the water in a basin is fully allocated for existing rights and environmental flows, Ecology must close the basin and ‘just say no’ to new rights. At that point, full mitigation is needed. Climate change will only make matters worse as snowpack and glaciers recede. Alternative water supply must focus on demand management, including conservation, use of reclaimed water, and changing our water ethic. Click here for a complete list of CELP’s Proposed Water Management Strategies. For a detailed analysis of the Swinomish decision, CELP will continue to attend Ecology’s Rural Water-Instream Flow process through September and into the 2015 legislative session, actively promoting the public interest in Washington’s rivers and aquifers. Protecting Columbia River flows is an important and longstanding part of CELP’s mission. From our 2000 publication of “Columbia River Vision” and petition for instream flow rulemaking, to our 2014 appeal of the Kennewick Hospital/Easterday water right (challenging issuance of a large new water right without instream flow conditions), the Columbia River has been a key part of CELP’s work for many years. Two years ago, CELP added a new item to our Columbia River portfolio when we began work in support of Columbia Basin Tribes and First Nations on modernizing the Columbia River Treaty. The Treaty is an agreement between the U.S. and Canada to manage the river to maximize hydropower production and flood control. The terms of the Treaty change in 2024 and this year the two nations are evaluating whether to negotiate to modernize the Treaty. A foremost concern is how to incorporate a new purpose into the Treaty: improvements in ecosystem function. For more information about the basics, see CELP’s Columbia River Treaty page. In April 2013, CELP and Save Our Wild Salmon encouraged the Columbia River Tribes and conservation groups to gather in Portland to coordinate strategy in the United States. Out of that meeting, conservation groups formed the Columbia River Treaty Conservation Caucus. Caucus members began work with Canadian groups and citizens to begin building an international alliance for treaty reform. This year, CELP co-sponsored a conference in Spokane on ethics and the treaty. In late May, on behalf of CELP, I met with the U.S. State Department in Washington D.C. to encourage treaty reforms. Below is a summary of the Declaration that issued from Gonzaga conference, followed by an update on Treaty status. 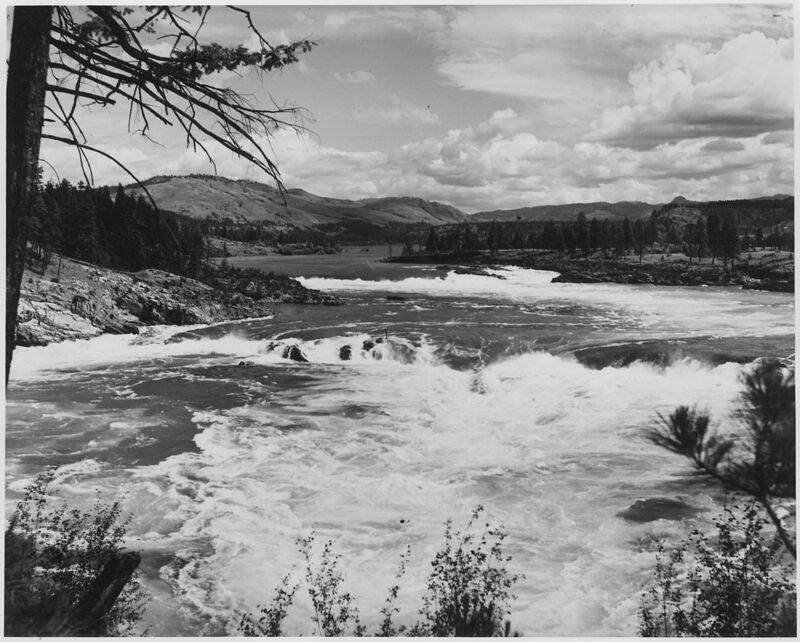 Kettle Falls was an important salmon fishing site on the Columbia River, and a place of great sustenance for indigenous people: Lakes People, Okanagans, Flatheads, Spokanes, Kalispells, Coeur d’Alenes, Sanpoils, Wenatchees, Entiats, interior Salish-speaking people, and others. In 1940 Grand Coulee dam permanently flooded Kettle Falls. CELP is joining with Tribes, First Nations, and others to return salmon to the Upper Columbia River. Declaration calls for modernizing Columbia River Treaty to right historic wrongs, advance stewardship. On May 13 people gathered at Gonzaga University in Spokane from around the Columbia Basin to attend a CELP-sponsored conference, Ethics & the Treaty: Righting Historic Wrongs. Participants heard first-hand accounts of terrible losses suffered by indigenous people as a result of dam-building on the Columbia River, and approved a Declaration calling on Canada and the United States for specific actions to right historic wrongs and achieve stewardship in managing the Columbia River. The Declaration notes that rights and management authorities of the Columbia Basin tribes in the U.S. and the First Nations in Canada were ignored in the Treaty ratified in 1964. Dams, including those built as a part of Treaty implementation, inflicted epic damage to the Columbia River and indigenous people who depended on native fish and wildlife. The trust obligations of the U.S. and Canada to ensure healthy, sustainable populations of salmon, sturgeon, lamprey, bull trout and other native fish and wildlife, their habitats, and other cultural resources within the Columbia River Basin, were not provided for in the Treaty. Indeed, Tribes and First Nations were not even consulted during its negotiation in the 1960s. In responding to the ethical breaches of the 1964 Treaty, the Declaration on Ethics and modernizing the Columbia River Treaty recognizes the Columbia River Pastoral Letter, authored by the bishops of the international watershed, as a template for decision-makers in both nations as they consider the moral dimensions of Treaty re-negotiations. The Declaration sets forth eight principles for modernizing the Columbia River Treaty. Respect the rights, dignity and traditions of the Columbia Basin tribes and First Nations by including them in the implementation and management of the Treaty. Include healthy ecosystem function as an equal purpose of the Treaty. Achieve balance among river uses for hydroelectric power production, coordinated flood risk management, and healthy waters and flows that provide for abundant and sustainable native fish and wildlife populations. Develop flow and water management operations to help people, native species, and entire ecosystems withstand climate change. Provide for ecosystem management of the region while protecting other river uses, including tribal commercial, and tribal ceremonial and subsistence activities. Engage local communities in a meaningful manner that is transparent and inclusive during renegotiation and future management of the Treaty. Address economic and environmental justice for the poor along with other aspects of economic development. Restore anadromous and resident fish passage to all historical locations throughout the Columbia River basin, including Chief Joseph, Grand Coulee, Hugh Keenleyside, Brilliant, and Waneta dams. The conference was hosted by Gonzaga University’s Political Science Department, Native American Studies, and Environmental Studies, held in Spokane on May 13. The U.S. State Department is expected to announce the United States’ negotiating position on the Columbia River Treaty later in 2014. Federal agencies have recommended that the United States and Canada “develop a modernized framework for the Treaty that ensures a more resilient and healthy ecosystem-based function throughout the Columbia River Basin while maintaining an acceptable level of flood risk and assuring reliable and economic hydropower benefits.” All four Northwest states, 15 Columbia Basin tribes, fishermen and environmentalists support that recommendation. In March, British Columbia released its draft recommendation that the Treaty be renewed and that changes occur within the existing framework. The B.C. Province holds that ecosystem values are currently and should continue to be an important consideration, as well as adaptation to climate change, in Treaty planning and implementation. The federal government in Ottawa has not yet announced Canada’s position. Over the coming year, CELP will continue its partnership with faith, Tribal and community leaders to promote basin-wide respectful dialogue seeking ethics-based reforms to the Columbia River Treaty. Modernization of the Columbia River Treaty is a once-in-a-generation opportunity to make real reforms that translate to real ecosystem improvements – including for instream flows – for the Columbia River. CELP’s Washington Water Leadership Award honors individuals and organizations who publicly advocate for sustainable water resource stewardship in Washington and the Pacific Northwest. 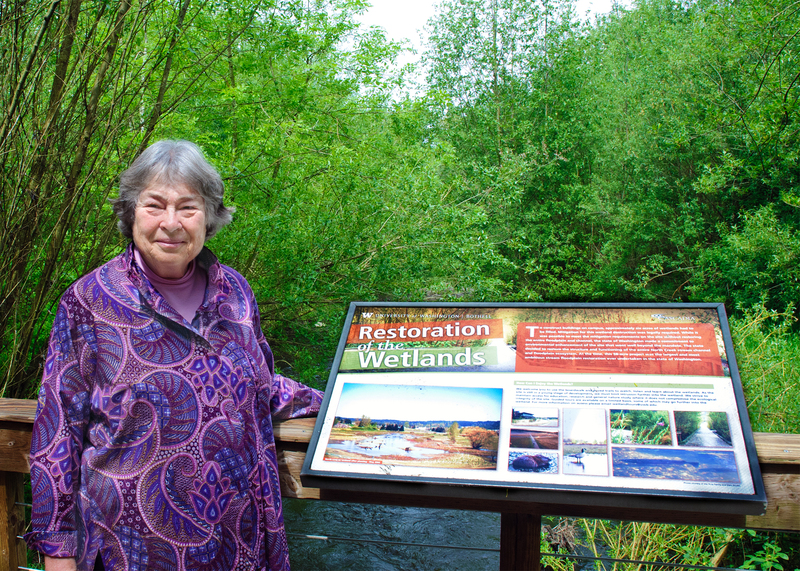 This year we will be giving the inaugural Washington Water Leadership Award to Senator Karen Fraser. 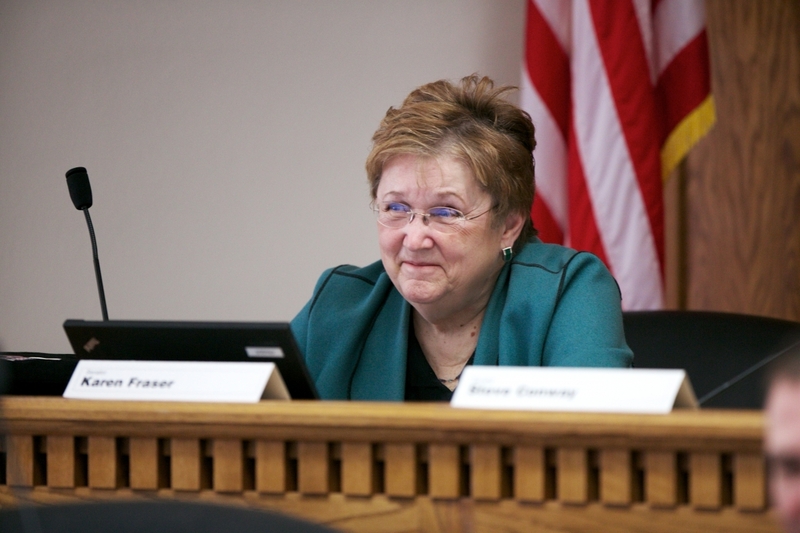 Senator Fraser represents Washington State’s 22nd Legislative District, the State Capitol area, and currently chairs the Senate Democratic Caucus. She has long been a champion of responsible water policy, and has been a vigorous advocate throughout her elective office career. She has spoken out in the State Legislature, in county and city government, in regional and national organizations, and at international forums. She also serves as Adjunct Faculty in the Master of Public Administration Program at The Evergreen State College where she includes an introduction to the intergovernmental complexities of water policy in her classes. We will honor Senator Fraser with the award at Celebrate Water on June 25, 2014. We hope to see you there!